The site of Kostënki 21 (also known as Gmelin or Gmelinskaia) is located on the very edge of the Don River at Kostënki (Voronezh Oblast, Russia). The main archaeological horizon, layer III, is dated to c. 23,000–21,000 14C BP (c. 27,500–24,500 cal BP) and contained six concentrations of archaeological material, mostly interpreted as the remains of dwelling structures. A substantial Gravettian lithic assemblage was found. The site has traditionally been seen as without parallels within the Gravettian chronocultural framework of Eastern Europe. It has long been noted that clear differences in the lithic typology and faunal assemblages of the six concentrations can be used to separate them into two groups, but this has previously been attributed to differences in the activities carried out in the two areas. In this paper, we argue that the two parts of the site were created at different times and that one part of the site can potentially be grouped with several other sites in Russia and Ukraine on lithic techno-typological grounds. The degree of patination of the flint artefacts found at the site provides support for our interpretation. The online version of this article ( https://doi.org/10.1007/s41982-018-0018-6) contains supplementary material, which is available to authorized users. The Upper Palaeolithic site of Kostënki 21 (also known as Gmelin or Gmelinskaia) is located at the edge of the village of Kostënki, c. 40 km south of Voronezh on the western bank of the Don River (Fig. 1). Kostënki and the neighbouring village of Borshchëvo are the location of the greatest concentration of Upper Palaeolithic sites in European Russia (Fig. 2): 26 sites have been identified in the area and are denoted by numbers (Kostënki 1–21 and Borshchëvo 1–5) as well as names (Praslov and Rogachëv 1982; Sinitsyn 2015). 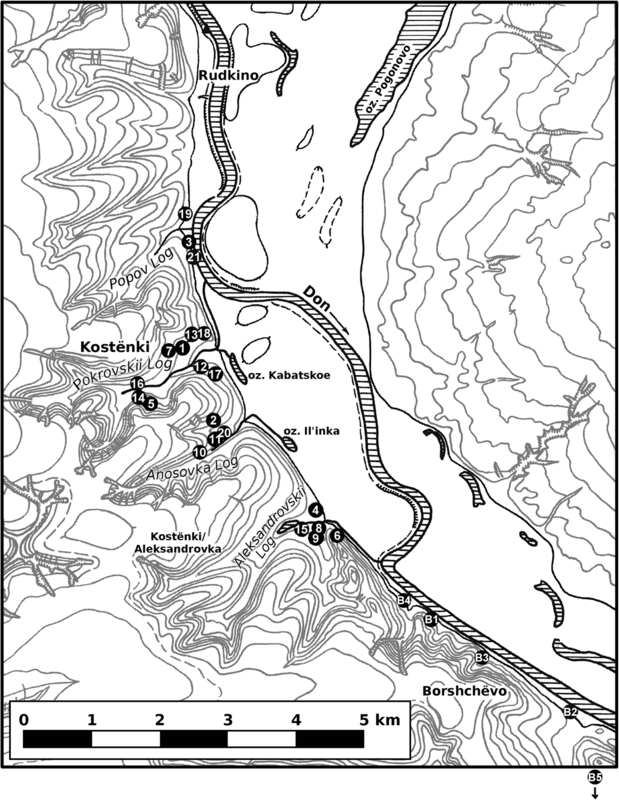 Kostënki 21 is located at the very edge of the present-day course of the Don River (Fig. 2) and has now been destroyed by fluvial erosion over much or all of its extent. 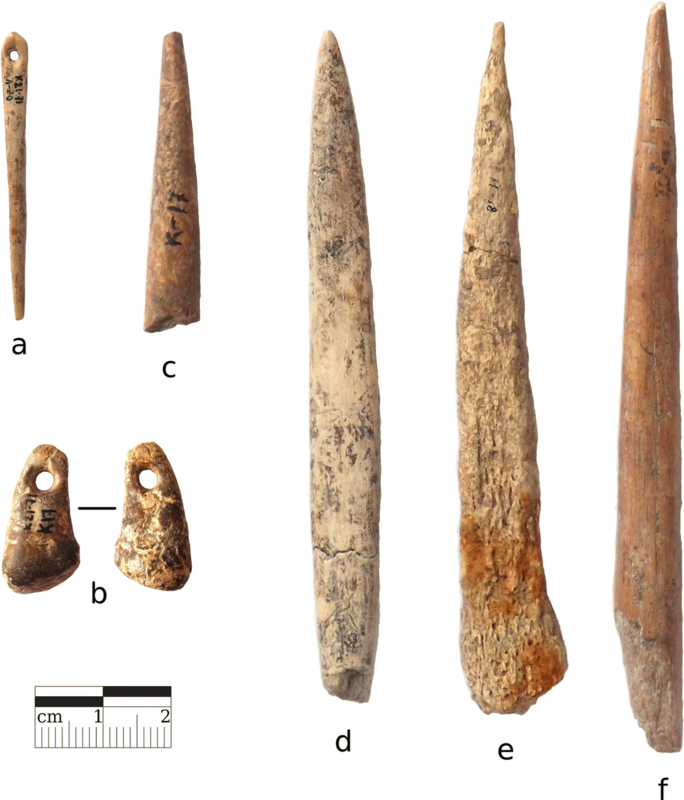 The principal archaeological horizon at the site, layer III, provided a large Gravettian lithic assemblage and extensive faunal assemblage dating to the very end of the Mid Upper Palaeolithic (MUP; c. 30–22,000 14C BP). Kostënki 21/III appears to post-date the “Kostënki–Avdeevo Culture” (Kostenkian) sites, well-known for the presence of sculpted female figures and shouldered points (Grigor’ev 1993; Gvozdover 1995; Sinitsyn 2007, 2015; Reynolds et al. 2017). The site is important for understanding the very latest Gravettian traditions in Russia, as well as the impacts of the Last Glacial Maximum (LGM) on human occupation of the region. Kostënki 21/III is a problematic site for the chronocultural framework of MUP Eastern Europe, because it has been impossible to assign it to any pre-existing Gravettian sub-unit or confidently group the site with any others in the region. Although numerous shouldered points were found at the site, the site is never grouped with the Kostënki–Avdeevo Culture sites, due to differences in the morphology of the shouldered points and the absence of other features that characterise the Kostënki–Avdeevo Culture sites. Some similarities have been seen with the assemblage from layer II of Kostënki 11 (also known as Anosovka II; Praslov and Ivanova 1982; Ivanova 1985; Anikovich et al. 2008; Sinitsyn 2014) as well as with the sites of Pushkari I and Klyusy (also Kliusy or Kliussy) in Ukraine (Ivanova 1985; Sinitsyn 2007, 2014) and Kostënki 5/III (Sinitsyn 2014). Kostënki 21/III has sometimes been linked together with other sites in a “Gmelinskaia” or “Gmelinsko-Anosovskaia” (Ivanova 1985) or “Anosovko-Gmelinskaia” (Anikovich et al. 2008) archaeological culture. The analogies between Kostënki 21/III and other sites have always been described, however, as partial rather than full. In recent years, the idiosyncrasy of the site has been stressed and it has been described as unique within the Kostënki Gravettian record (Sinitsyn 2007, 2015; Bessudnov 2015a, 2016). The problem with linking this assemblage to others lies in the fact that although secure analogies can certainly be found elsewhere for certain aspects of the archaeological material found at Kostënki 21/III, definite differences are always encountered when the lithic, faunal and artistic profile of Kostënki 21/III is compared as a whole with other sites. At Kostënki 21/III, finds were clustered in six well-defined spatial concentrations. Clear differences between the concentrations in the typology of their lithic collections have previously been noted, and they have been divided into two groups on this basis: the southern group and the northern group (Fig. 3; Praslov and Ivanova 1982; Ivanova 1985). There are also differences between the faunal assemblages from the southern and northern groups. These differences have usually been attributed to activity differences between simultaneously occupied parts of the site (Praslov and Ivanova 1982; Ivanova 1985; Anikovich et al. 2008). An alternative explanation, not previously put forward in the literature, is that there are in fact chronocultural differences between different parts of the site: i.e. that the two parts of layer III were created at different times by groups of people employing different lithic traditions. To test this possibility, we carried out new studies of the lithic and faunal assemblages from the site, which we present here. In order to better understand the position of the site within the regional chronocultural framework, we also carried out comparative studies of other Russian lithic assemblages. 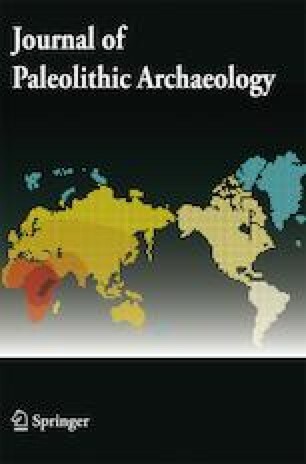 In this paper, we argue that the differences between the two parts of the site are best understood as reflecting the existence of two chronoculturally separate phases of activity and that the northern part of the site can potentially be grouped with several other sites in Russia and eastern Ukraine. Kostënki 21 was discovered in 1956 by N. D. Praslov, who led excavations there in 1956–1961, 1964, 1967, 1969, 1971–1972 and 1976–81, as well as further excavations during the 1980s (Vekilova 1977; Ivanova 1985; Bessudnov 2016). 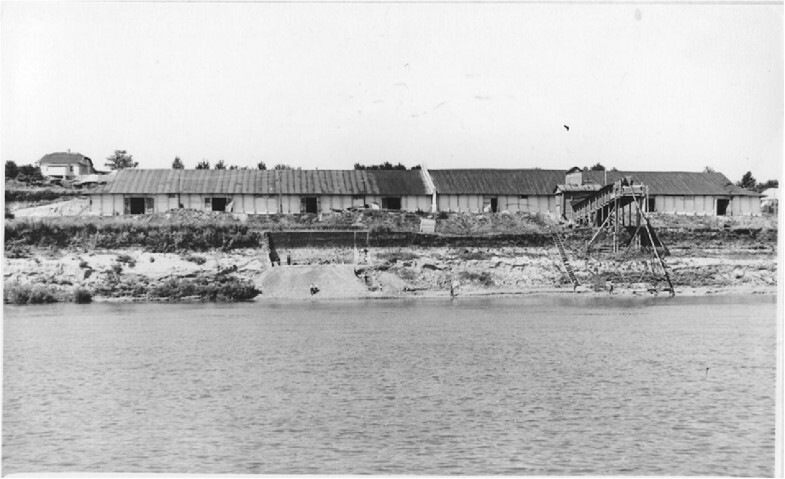 The twentieth-century excavations extended for c. 160 m along the river bank, and more than 510 m2 was excavated in total by the early 1980s (Figs. 3 and 4). Due to active erosion by the Don, the excavations were carried out as rescue excavations (Praslov and Ivanova 1982; Praslov 1985; Bessudnov 2015b; Fig. 5). Further limited rescue excavations were carried out in 2013–2016, led by A. A. Bessudnov (Bessudnov 2015b, 2016, 2017, 2018). The richest and most extensive archaeological layer is the lowermost layer, now known as layer III, which was the first to be recognised. Around 35–36,000 lithic artefacts were attributed to this layer during the twentieth-century excavations of the site (Ivanova 1985); over 1000 additional artefacts were found during the more recent work (Bessudnov 2015b, 2018). Two much poorer archaeological layers, higher in the sequence, were discovered later: layer II during the 1971 excavations and the uppermost layer I during the 1976–1979 excavations (Fig. 6). The assemblages from layers I and II are very limited, and each contains only around 50 lithic artefacts. Layer I was found over an area of just 22 m2. Layer II had a larger identified distribution of c. 170 m2 during the twentieth-century excavations but appeared to consist of redeposited material (Praslov and Ivanova 1982). A couple of lithic artefacts found during the 2014 excavations were also attributed to layer II (Bessudnov 2015b). Kostënki 21 is located on the first terrace above the Don, c. 200 m downriver from the mouth of the stream that flows from the ravine of Popov Log (Fig. 2; Praslov and Ivanova 1982). 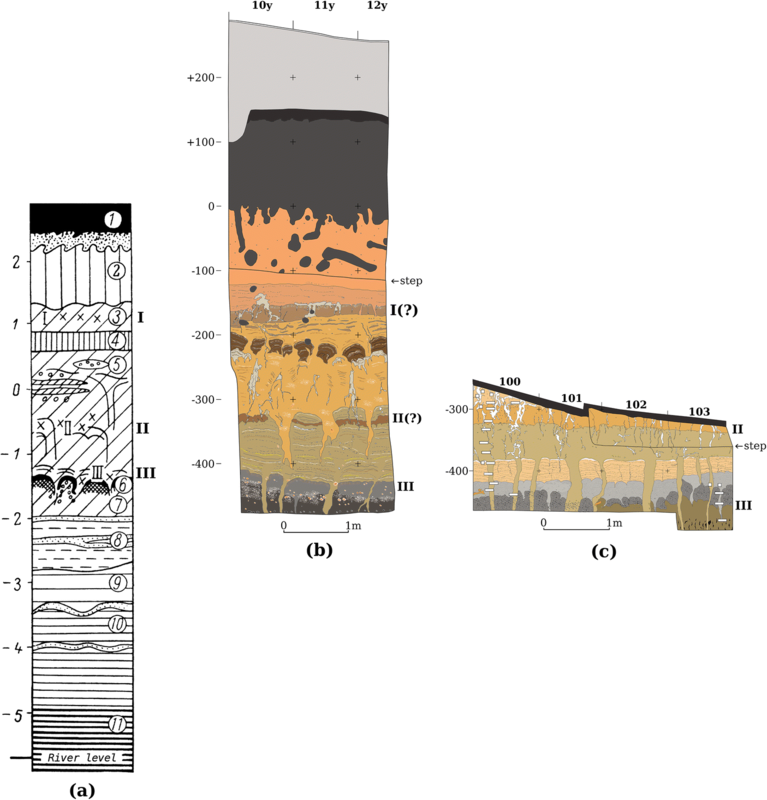 Layer III was found at a depth of several metres, buried under a series of alluvial and colluvial deposits and “loess-like loams” (clay-rich sediments), in association with a poorly expressed humified horizon that had been subject to significant cryogenic disturbances (Fig. 6; Praslov and Ivanova 1982; Bessudnov 2016). This horizon has been correlated with similar layers at other Kostënki–Borshchëvo sites, which are often referred to as the “Gmelin soil” in reference to the first description of the horizon at Kostënki 21 (Praslov et al. 1977; Holliday et al. 2007; Pietsch 2013). The vertical distribution of layer III material sometimes reached 40 cm as a result of cryogenic processes, although the layer’s usual thickness was around 5–7 cm (Praslov and Ivanova 1982; Bessudnov 2015b). In this layer, displacement of archaeological material due to post-depositional processes appears to have been mainly vertical rather than horizontal (Praslov and Ivanova 1982). The site’s location on the first terrace places all three layers of the site in the third (final) chronological group of the general geochronological framework for the Kostënki Palaeolithic sites, along with sites found above the Upper Humic Bed elsewhere at Kostënki–Borshchëvo (Rogachëv 1957; Sinitsyn 2007, 2015). A number of radiocarbon dates have been published for layer III (Table 1). The more ancient dates are most likely to be indicative of the real age of the samples given that radiocarbon dates, when incorrect, tend to appear younger than they should (Higham 2011). It can also be noted that the raw value of one of the published dates for layer II (22,900 ± 150; LE-1437C) is in fact more ancient than any of those published for layer III, although this is only a single date and does not alone contradict the dates for layer III when the errors are taken into account. The published dates suggest an age of c. 23–21,000 14C BP for layer III, which is supported by further unpublished radiocarbon results (K. Douka, pers. comm.) and the available thermoluminescence date (Table 2). This corresponds to a calibrated age of c. 27,500–24,500 cal BP (using IntCal 13 and OxCal 4.3; Bronk Ramsey 2009; Reimer et al. 2013). The distribution of the dates with respect to particular complexes does not provide any obvious indicators of the internal chronology of the site: the dates for the northern complexes (including the unpublished dates) do not clearly fall within the older or younger part of the time range in question (Table 1). Unfortunately, for the majority of samples used for radiocarbon dating, no information is available concerning their exact findspots within the site. bP. Haesaerts and F. Damblon, pers. comm. A direct comparison of the calibrated radiocarbon age of the layer with the Greenland Ice Core Chronology (GICC) suggests that it dates to the first half of Greenland Stadial 3 (GS 3; Rasmussen et al. 2014). This would place it during the LGM itself according to the definition proposed by some researchers (Hughes and Gibbard 2015). If this is correct, then the correlation with the “Gmelin soil” may suggest that the layer dates to a short interval of relative warmth and humidity during this stadial period. The overall spatial layout of layer III is well-described in the literature, as follows. Six concentrations of material, called “complexes” (“kompleksy”) in the Russian literature, were identified during the twentieth-century excavations (Table 3, Fig. 3). Only occasional isolated finds were made in the areas between these concentrations. Due to active erosion by the Don, most of the complexes were to some extent destroyed prior to their archaeological investigation. The complexes have previously been separated into two groups based on the contents of their lithic assemblages and their overall sizes. The groups consist of the “southern” (sometimes “manufacturing”) complexes and the “northern” (sometimes “dwelling”) complexes. Two large concentrations of finds—c. 40 m2 and c. 70 m2—belong to the southern group. The first of these (complex 1) has been interpreted as the remains of a large circular structure with an internal hearth; the limits of the latter (complex 2) were less well-defined, and it lacked a clear hearth (although concentrations of burnt material were found). Very large amounts of lithic material were found within these two concentrations: c. 7000 artefacts in complex 1 and c. 26,000 in complex 2. The northern group (complexes 3–6) consists of four relatively small accumulations, c. 12–16 m2 in area, which have been interpreted as dwelling structures: three of them had hearth pits preserved at their centres. Far less lithic material was found in the northern group than the southern: altogether fewer than 3000 lithic artefacts were collected from complexes 3 to 6 (Praslov and Ivanova 1982; Ivanova 1985; Ivanova et al. 1987). Systematically produced backed lithic artefacts are represented in all Kostënki 21/III complexes: backed bladelets predominate within this category (Ivanova 1985; Reynolds 2014). 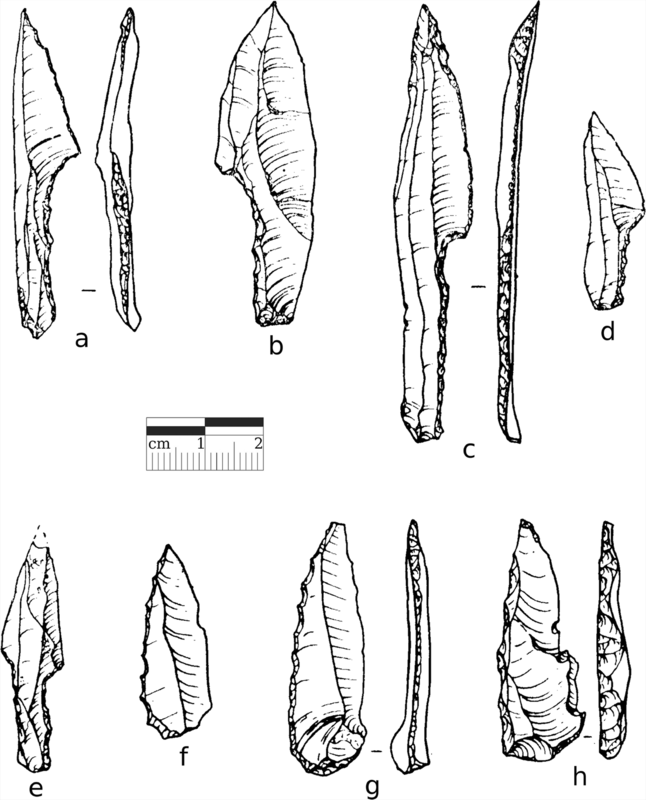 Other lithic types such as endscrapers, burins and retouched blades are also present in all complexes (Praslov and Ivanova 1982; Ivanova 1985). The lithic raw material used at Kostënki 21/III was almost exclusively high-quality fine-grained flint (Praslov and Ivanova 1982; Ivanova 1985). A study of the backed bladelets from the site (Reynolds 2014) did not find any significant differences between the collections from each complex in their morphology, dimensions, blanks or retouch types. Despite these general commonalities, a marked typological difference between the two groups of complexes has been identified and widely discussed (e.g. Praslov and Ivanova 1982; Ivanova 1985; Anikovich et al. 2008). This concerns the presence and absence of two types of backed point: small shouldered points are found only in the southern group, while Anosovka points are restricted to the northern group. The shouldered points from layer III (Figs. 7 and 8) are made on small blades, with backed, shouldered stems. Previous work has suggested that they constitute a unique series compared to shouldered points from other late Gravettian sites (Ivanova 1985; Sinitsyn 2007, 2015). They are clearly different, in their size, morphology, and technology of production, from the overall profile of those found at the sites of the Kostënki–Avdeevo Culture (Kostenkian/Eastern Gravettian sensu stricto), including Kostënki 1/I, Avdeevo and Zaraisk, and further west at sites of the “shouldered-point horizon”/“Kostënki-Willendorfian”, such as Kraków-Spadzista (Otte 1981; Grigor’ev 1993; Gvozdover 1995; Kozlowski 1998; Sinitsyn 2007, 2015). They are also very different from the backed points found at Khotylëvo 2 (Bulochnikova and Grigor’ev 2005; Gavrilov 2008; Reynolds 2014). The Anosovka points found at the site (Figs. 7 and 9) are small, wide-based points with one backed edge. They have been compared to Azilian points by Beliaeva (2002) and Anikovich et al. (2008) and to Azilian and Federmesser points by Sinitsyn (2007, 2014, 2015), who suggests that the similarity is due to convergent evolution rather than any direct cultural link. The Anosovka points and these Late Upper Palaeolithic point types are indeed very similar in their general morphology and technology, despite the chronological and geographical separation between them (Schwabedissen 1954; Riede 2014; Sobkowiak-Tabaka 2017). We prefer to maintain a distinct term for Anosovka points for the sake of clarity, but the similarities are certainly notable, particularly from the point of view of studying convergent evolution in lithic traditions. The results of our new study of these two groups of points are presented below (sections “Shouldered Points (Southern Group of Complexes)” and “Anosovka Points (Northern Group of Complexes)”). Other differences between the lithic assemblages from the northern and southern zones have also previously been noted: for example, the presence of “Gmelinskie knives” in the northern collections (Praslov and Ivanova 1982; Ivanova 1985), the presence of heterogeneous small elongated backed points in the collections from the southern complexes (Ivanova 1985; Reynolds 2014) and apparent differential usage of blank types, with bladelets being more important in the southern complexes (Ivanova 1985; Anikovich et al. 2008). The faunal assemblages from each group of complexes have also been long recognised as presenting clear contrasts. Differences in species composition, particularly the importance of hare remains in the southern group of complexes, have previously been highlighted (Ivanova et al. 1987). The results of our new study of the faunal assemblage are presented below (section “Kostënki 21 Layer III: Results of Faunal Assemblage Study”). Other material found at Kostënki 21/III is also important for the characterisation of the site. The assemblage from the southern complexes contains a series of pendants and pendant fragments (including of ivory and of deer canine), a number of bone points/awls, an eyed bone needle and needle fragments, a large pierced ivory object and other worked bone objects, including a slotted tool (Fig. 10). The needles and a series of ivory pendants or pendant fragments were found within a few metres of each other in complex 2. There are also two sandstone discs with engravings of animals and some pieces of ochre, including one marked with clear incisions and another with traces of working (Fig. 11). For the northern complexes, the collection is also substantial and includes fragments of bone points, fragments of flat oval ivory pendants and pieces of ochre, some with patterned incisions (Fig. 11). There are also pieces of worked bone from the northern complexes, including a large pigmented and incised fragment of mammoth rib, as well as a worked fossil shell (Praslov and Ivanova 1982; Ivanova 1985; Praslov 1985; Abramova 1995). Previous researchers have typically interpreted the differences between the southern and northern zones of the site as reflecting functional patterning within a simultaneously occupied area. Praslov and Ivanova (1982) note the relatively low proportion of retouched lithics at complex 2, as well as the sometimes very high concentration of lithic artefacts (up to 2000 artefacts per m2) and suggest that the southern complexes were an area for knapping and working flint, while they describe the other complexes as dwellings. They see the division of complexes as linked with the differentiation of areas within a single settlement for various domestic activities. Ivanova (1985) again favours this interpretation and presents further evidence about the faunal assemblage suggesting that certain areas away from the small dwelling complexes were used for carcass processing. Kozłowski (1986, p. 149) uses the example of the site as “the best evidence for the almost synchronous occurrence of totally different assemblages” within the Eastern European Gravettian record. Ivanova et al. (1987) extend the interpretation of the site with results from a study of the faunal and osseous assemblage, arguing that the southern complexes were used for the production of bone artefacts as well as flint tools. As mentioned above, they describe very clear differences between the southern and northern complexes in the composition of the faunal assemblages, with almost all the hare remains (in their study) being found in the southern complexes, while they identified reindeer only in the northern complexes. They note that refitting fragments of horse metapodial were found in complexes 1 and 4, and hence argue that the northern and southern complexes were synchronous. Anikovich et al. (2008) describe the two groups of complexes at Kostënki 21/III as very different from one another but maintain that they belong to a single site. In their opinion, strong differences between two areas of a site are logically possible, and reflect a complex social structure (e.g. the presence of people from different cultural traditions, or of separate areas for men, women, children, etc.) or the use of different areas for activities relating to different types of hunting. Thus, the consensus on Kostënki 21/III has favoured an interpretation where all parts of the layer were occupied synchronously, despite the well-described differences between the two groups of complexes. In Soviet archaeology, approaches to the spatial analyses of Palaeolithic sites were sophisticated, and this aspect of archaeology was emphasised in both excavation practice and archaeological theory. This was due in part to the nature of the archaeological record itself (the prevalence of large and spatially complex open-air sites) and in part to particular research directions (including an interest in prehistoric intra-group social organisation) (Soffer 1985, pp. 8–15; Djindjian 2013; Iakovleva 2016). The acceptance of the spatial patterning at Kostënki 21/III as a reflection of social and functional organisation within a contemporary settlement should be seen within this context. There is, however, an alternative interpretation of the spatial patterning seen at Kostënki 21/III. As recently noted in relation to the backed artefacts generally (Reynolds 2014), a key difference between the northern and southern groups concerns the average degree of patination of the flint assemblages: those from the northern group are generally much more heavily patinated than those from the southern group (further discussed in the “Discussion” section). This difference raises questions regarding a possible chronocultural separation between the two parts of the site. By this, we mean that the principal occupations of the northern and southern parts of the site may have been separated in time and that the lithic traditions of the people who created the northern and southern groups of complexes differed. If this is the case, the site represents an example of the widespread problem of palimpsest identification and intra-level diachronicity (e.g. Gaudzinski-Windheuser et al. 2011; Bargalló et al. 2016; Roda Gilabert et al. 2016). Here, however, the question concerns whether not only multiple stages of activity, but two separate cultural traditions, are represented within a single archaeological layer. In order to verify the reality of the apparent differences in lithic techno-typology and faunal assemblage composition between the southern and northern zones, and to explore them in detail, we carried out new studies of the lithic and faunal collections from Kostënki 21/III. Further, to our aim of verifying the place of Kostënki 21/III within the chronocultural framework of Eastern Europe, we also studied two other late Gravettian lithic assemblages from Russia (Gagarino and Kostënki 11/II) for comparative purposes. Our study of the Kostënki 21/III lithic assemblage, carried out in 2017, concentrated on the shouldered points and Anosovka points from the twentieth-century excavations held at the Institute for the History of Material Culture RAS, Saint Petersburg. In order to assess the degree of patination of material, we carried out visual inspection of the entire retouched lithic assemblage and part of the unretouched assemblage from Kostënki 21/III. In 2017, we also studied lithic material from Gagarino and Kostënki 11/II, concentrating on backed points. The material from Gagarino derived from Zamiatnin’s 1926–1927 and 1929 excavations, held at the Peter the Great Museum of Archaeology and Ethnography RAS (Kunstkamera), Saint Petersburg, and Tarasov’s 1961–1969 excavations, held at the State Historical Museum, Moscow; and the Kostënki 11/II material derived from Rogachëv’s 1956, 1960 and 1965–1966 excavations, held at the Kostënki State Archaeological Museum-Reserve, Voronezh Oblast (Zamiatnine 1934; Tarasov 1979; Rogachëv and Popov 1982). 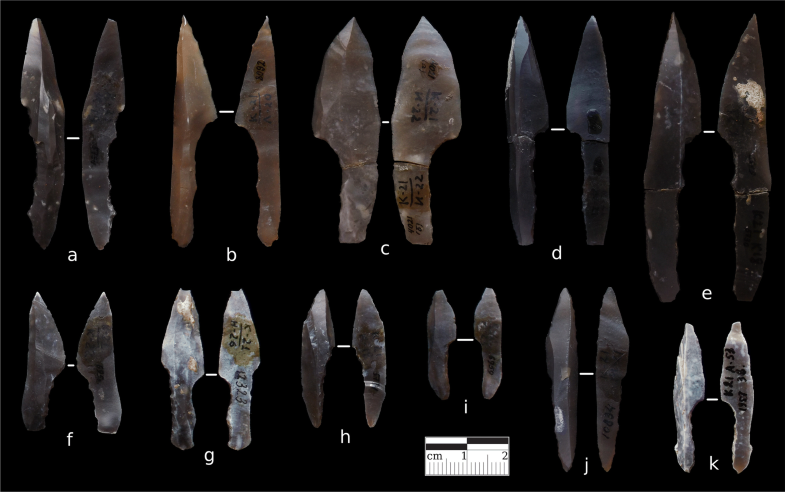 Lithic recording focused on standard technological and morphological variables (see SI 3 for details), and our terminology is based on the definitions by Inizan et al. (1999). Statistical analyses were carried out in R 3.4.3 (https://www.r-project.org). The faunal collections from the twentieth-century excavations of Kostënki 21/III, held at the Zoological Institute RAS, Saint Petersburg, and the Institute for the History of Material Culture RAS, Saint Petersburg, were studied in 2000, 2001 and 2017. The skeletal elements of the Kostënki 21/III mammal assemblage were counted as number of identified specimens (NISP) and as minimum number of individuals (MNI) (Lyman 1994). The anthropogenic cut and impact marks and the carnivoran gnawing traces on the mammal remains were identified based on the descriptions in Binford (1981), Lyman (1994) and Fernández-Jalvo and Andrews (2016). Measurements of the large canid remains were carried out according to von den Driesch (1976) or were taken from Ivanova et al. (1987). The results were compared with data for several reference groups. The Palaeolithic dogs reference group contains canids from Upper Palaeolithic sites from Belgium, the Czech Republic and the Russian Plain (Germonpré et al. 2017a). The second reference group includes recent northern dogs from Siberia, Sakhalin and Greenland (Germonpré et al. 2015, 2017b). The third reference group contains Pleistocene wolves from the Trou des Nutons cave in Belgium (Germonpré et al. 2009), the Jaurens and Maldidier Caves in France (Boudadi-Maligne 2010) and the Geographical Society Cave in Primorsky Krai, far eastern Russia (Baryshnikov 2015) (see also Germonpré et al. 2017b). The sites where the Pleistocene wolves were found presumably date to the Pleniglacial. The final reference group consists of recent northern wolves from Sweden and Russia (see also Germonpré et al. 2017b). Skeletal elements are termed “dog-like in size” when at least one of their measurements falls within the observed range (OR) of the recent northern dogs and/or Palaeolithic dogs and is smaller than the lower limit of the ORs in our wolf data sets (cf. Germonpré and Sablin 2017). The canid specimens are termed “wolf-like in size” when the measurements are larger than those in the ORs of these measurements from the dogs and if at least one dimension is larger than the means of the ORs of these measurements in the wolf data sets. The canid specimens are described as “wolf-range in size” when their dimensions are larger than those of the dogs and/or fall within the ORs of the wolf groups but are smaller than the mean of the ORs of the wolves in our data sets (cf. Germonpré et al. 2017b). The use of these terms does not imply that the “dog-like in size” canids are Palaeolithic dogs nor that the “wolf-like in size” or “wolf-range in size” canids are Pleistocene wolves, although it is possible that “dog-like in size” canids could be female Palaeolithic dogs and “wolf-like in size” canids could be male Pleistocene wolves. Nevertheless, it would be interesting to analyse these remains in more detail in the future. For metric data on other species at Kostënki 21/III, we referred to Ivanova et al. (1987) and Sablin (2001). For the paleobiological aspects of the mammoth, we used data on ageing and reproduction in extant elephants. Recent African and Asian elephants are similar to one another in several aspects of their biology and behaviour, with similar gestation periods, birth rates and maximum lifespans (of about 60 years) (Olivier 1982; Haynes 1991, 2017). The habits and life cycle of the woolly mammoth were probably similar, to some extent, to those of recent elephants (e.g. Saunders 1980; Haynes 1991, 2017; Maschenko 2002; Fisher et al. 2014). Based on detailed analyses of the microstructure of mammoth dentition, the gestation length of mammoth has been estimated to have been 20–22 months (Fisher et al. 2014; Grigoriev et al. 2017), slightly shorter than in the recent African elephant, which usually has a gestation length of about 22 months (Moss 1988). Conception likely occurred in late spring and birth probably took place in early spring just before the vegetational winter–spring boundary (Rountrey et al. 2012; Grigoriev et al. 2017). Maschenko (2002) described several juvenile mammoth remains from the Russian Plain and Siberia in detail. We use his age attributions for the Kostënki 21/III mammoth calves here. The shouldered points from the site were found only in complexes 1 and 2 and form a homogeneous and numerous group. Forty-seven shouldered points were identified in the twentieth-century Kostënki 21/III collection during our 2017 study (15 unbroken or refitted artefacts, 29 distal fragments, 2 proximal and 1 medial). To be included in our study, the artefact had to have a stem and clear shoulder formed with backing, and a pointed retouched or unretouched limbe (non-stem part; de Sonneville Bordes 1969). If a fragment, the artefact had to have at least a clear backed shoulder and features consistent with fulfilling the other criteria. The data recorded are available in SI 1 and 3 of this article. The shouldered points from Kostënki 21/III are made on bladelets or small blades, either triangular or trapezoidal in section, with pointed distal ends. The pointed end of the artefact is always located on the distal end of the blank. The majority of artefacts have slightly concave ventral surfaces. They usually bear marginal semi-abrupt retouch on both edges of the limbe, either localised around the point or in a few cases along the entire length of the limbe. Ventral retouch of the distal ends was rare (seen in four cases only of 44 observable distal ends, 9%). The backing of the stem and shoulder is always direct and abrupt. The backing is located on the right edge of the blank about two-thirds of the time (30 of 47 cases, 64%), with a further single artefact having backing on both edges of the stem. The striking platforms and bulbs of percussion were left intact about half of the time. Where entire points have been refitted from fragments (n = 4), the break is found at the proximal end of the shoulder or further down the stem. There is often some light macroscopic use-wear (which may be post-depositional) on the unretouched edges and/or localised around the pointed tips of the artefacts. There is a great deal of variation in the dimensions of the artefacts: the lengths of the unbroken/refitted points range from 27 to 78 mm (n = 15, mean = 47.6 mm, SD = 15.0), while the lengths of the limbes alone range from 11 to 41 mm (n = 39, mean = 23.2 mm, SD = 6.7). The maximum widths of all the artefacts range from 3 to 17 mm (n = 47; mean = 9.4 mm; SD = 2.7). The widths of the artefacts and the lengths of the limbes form normal distributions. The lengths of the unbroken artefacts do not, and neither do the lengths of the stems on their own, but there are only 15 and 17 relevant measurements, respectively. The data appears consistent with the artefacts having been created according to a single technological and morphological “template”, albeit with a large amount of size variation, perhaps especially for the stems (suggesting that there were not strong constraints on their dimensions). Fuller details of the dimensions of these artefacts are given in the section “Gagarino: Comparison of Shouldered Points” below. The Anosovka points from Kostënki 21/III, which were all found within the northern complexes, also form a very homogeneous series of artefacts. During the 2017 study, we identified 26 artefacts within the collection, of which all were unbroken except for a single distal fragment (this very high representation of unbroken artefacts may be at least partially explained by the difficulty of reliably identifying fragments of Anosovka points; their morphology may also make them relatively resistant to breakage). To be identified as an Anosovka point for the purposes of our study, the artefact had to be small (less than 5 cm long), have a clear point formed by the convergence of one backed straight or convex edge and the unbacked edge of the blank and have a wide base (following Praslov and Ivanova 1982; Ivanova 1985; Beliaeva 2002; Sinitsyn 2013, 2014). The data recorded are available in SI 2–3 of this article. The Anosovka points are typically made on blades, occasionally with extant hinged terminations. At least one artefact appears to have been made on a lame sous crête or neo-crested blade. The unbroken artefacts (n = 25) range in length from 21.5 to 43 mm (mean = 34.1 mm; SD = 5.2) and 7.5–14.4 mm in width (mean = 11.9 mm, SD = 1.5). The artefacts are typically quite wide in relation to their length: the width:length ratio ranges from 1:2.1 to 1:3.5 (mean = 1:2.9, SD = 0.4). Their maximum thicknesses range from 2.5 to 5.5 mm (mean = 3.8 mm, SD = 0.9). Most often (20 of 26 cases, 77%) the pointed end of the artefact is located towards the proximal end of the blank. In profile, about half of the artefacts have a flat ventral surface (to within ~ 1 mm tolerance); the remainder have ventral faces that are somewhat convex, concave or twisted: some are quite heavily twisted. The sides of the artefacts are formed by one edge which is almost always unretouched and one edge which is backed with direct abrupt retouch (rarely, crossed-abrupt retouch was used). This backing is typically slightly convex and often cuts diagonally across the entire width of the blank to create the shape of the piece (Figs. 7 and 9). The backing is usually located on the left edge of the artefact (i.e. on the left hand side of the dorsal face when the pointed end is oriented distally): this was the situation in 19 of 26 cases (73%). The pointed end of the artefact, formed by the intersection between the backed and unbacked edges, is typically acute in angle and quite sharp. The base is usually blunt. In the majority of cases (18 of 25 observable bases, 72%), this was achieved by backing with direct abrupt or semi-abrupt retouch. In some cases (n = 3), a hinged blank termination was used as the base of the artefact, while in others (n = 4) another type of unretouched proximal or distal end of a blank was used. The shapes of the bases and the extent and shape of their retouch vary: they may be straight and oblique, slightly concave, rounded or sub-trapezoidal in form. 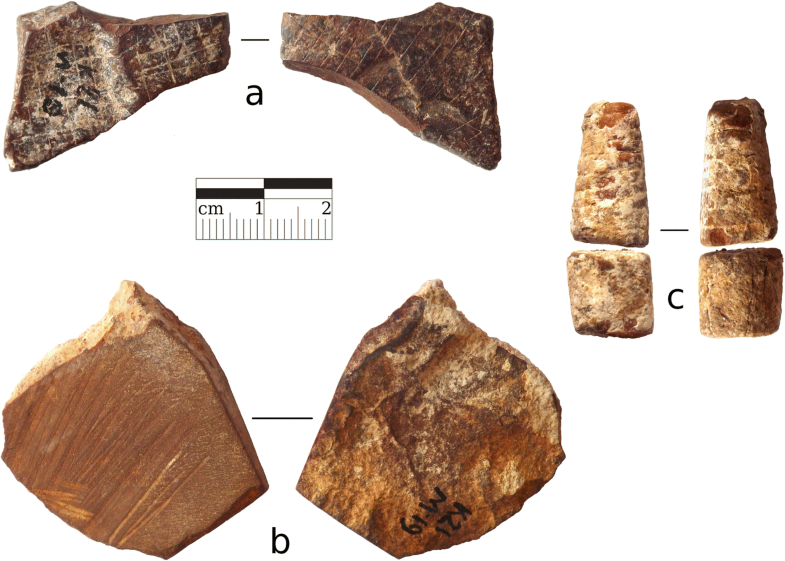 In a few cases (n = 3), the striking platform and bulb of percussion were not removed, but in these examples, the pointed end of the artefact was located towards the distal end of the blank. Some macroscopic damage was frequently but not universally observed on the unretouched edges of the artefacts: it is most often light and not localised (and may be post-depositional). One artefact appears frost-damaged. Although similar flint was used for the majority of the artefacts from both the southern and northern zones, a striking difference can be seen between the two parts of the assemblage when patination is considered. Our visual inspection of the retouched collections from Kostënki 21/III suggested that the material from the southern group was usually only lightly patinated, while that from the northern group usually bears medium or heavy blue-white patina. This pattern was also supported by a partial inspection of the unretouched collections. 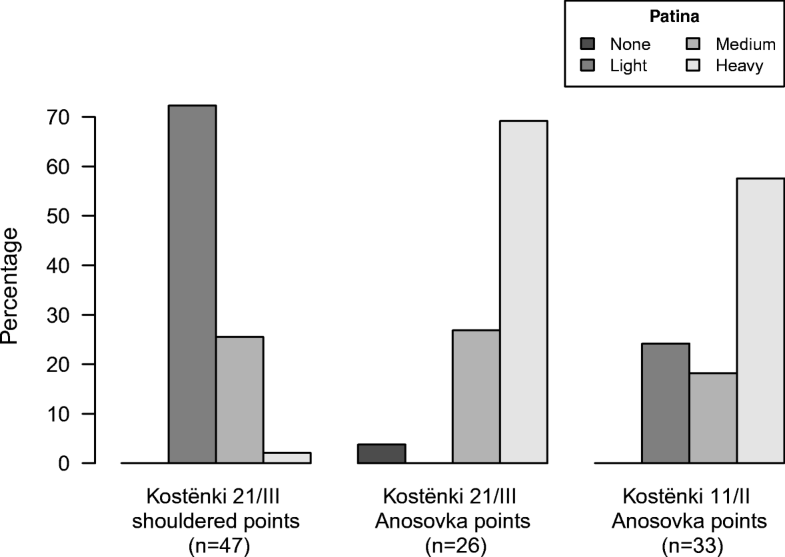 The differences in patination are extremely clear for the studied shouldered points and Anosovka points from Kostënki 21/III (Fig. 12). Seventy-two per cent of the shouldered points were only lightly patinated, and only a single artefact (2%) was heavily patinated. Conversely, 69% of the Anosovka points were heavily patinated, while none were lightly patinated (although one artefact had no patination). The difference is noticeable in photographs of the artefacts (Figs. 8 and 9). In a previous study of the Kostënki 21/III faunal collection (Ivanova et al. 1987), the NISP of the Kostënki 21/III mammals totalled 2510, with a MNI of 48–54 individuals. We were able to study 1413 identified specimens, corresponding to a MNI of 42: about half of these (758 specimens) derived from the southern complexes, and 655 from the northern complexes (Tables 4 and 5). Representation of faunal remains is far less biased towards the southern complexes than representation of lithic artefacts. For horse, rhinoceros and large bovids, we identified more bones than Ivanova et al., while for bear and lynx, the same number of bones was studied. However, fewer skeletal remains from hare, large canids, fox, mammoth and reindeer were seen in this study compared to that of Ivanova et al. Material not seen by us includes foetal mammoth remains (Maschenko 2002) and reindeer milk dentition (Ivanova et al. 1987). The total number of bone fragments in the collection we studied from the southern assemblage amounted to 1371, of which 758 (55%) could be identified to taxon (Table 4). The following taxa were present: hare, large canids, fox, bear, mammoth, horse and large bovids. About 9% of the bones showed traces of human modification. No gnawing traces could be discerned. Mammoth is the dominant species in the southern assemblage based on the MNI and NISP (MNI = 8 including foetal remains) (Table 4). 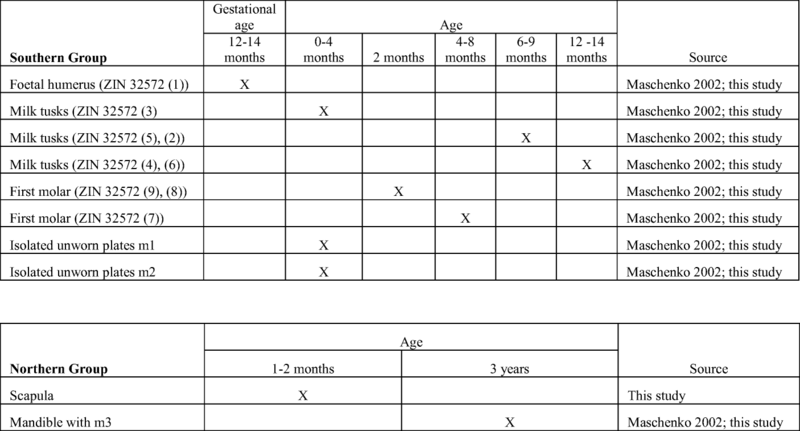 Four age groups can be distinguished in complex 2: foetal, juvenile, subadult and adult. The foetal age group consists of a cut-marked humerus (32572 (1)) from a mammoth that died at a gestation age of about 14–16 months (Maschenko 2002). The assemblage includes further five milk tusks with varying degrees of enamel wear and closing of the root canal. Two tusks are from a calf that probably died at an age of less than 4 months based on the minimal wear and open root canal; two tusks can be assigned to a calf that was between 6 and 9 months old when it died, on the basis of more extensive wear; finally, one milk tusk is from a mammoth that probably died when it was about 1 year old, based on its extensive wear and closed root canal (Maschenko 2002) (Table 6). A complete first milk molar (32572–8), on which the first two plates show wear, is from a calf that died at an age of about 2 months according to Maschenko (2002). Another first milk molar (32572–7) with all its plates in wear was, according to Maschenko, between 4 and 8 months old when it died. Furthermore, several isolated plates from the first and second molars are not in wear; according to Maschenko, wear begins at about 4 months; therefore, these fragments are from animals that may have died before that age (Table 6). More or less all skeletal elements of mammoth calves are represented. The adult assemblage is restricted to cranial remains, an iliac fragment, three carpalia and a metatarsus. The adult jugal tooth fragments cannot be attributed to a specific molar. Sixteen ivory ornaments and two ivory tools were identified in complex 2 (section “Overview of Previous Work on the Planigraphy and Assemblage of Layer III”, above; Fig. 10). A large quantity of small ivory fragments was found in complex 2, which can be related to ivory working in this area. The hare is the next most dominant species in the mammal assemblage from the southern group of complexes based on both MNI and NISP (MNI = 7; Table 4). Almost all skeletal elements are represented and are from adult hares. Isolated teeth, lower jaws, humeri and ulnae are the most frequent elements. None of the bones display evidence of gnawing marks, corrosion damage from gastric fluids or polishing, which characterise accumulations of leporid bones by raptors or carnivores (Hockett and Bicho 2000). Cut marks occur on six bones: they are related to skinning (on a metapodial bone and a distal tibia), dismembering (on the distal trochlea of three humeri) and filleting (on the diaphysis of a radius). Impact marks for obtaining marrow could be recognised on several long bones. Thirteen bones of arctic fox were found dispersed over the surface of complex 2. They belong to at least four individuals, all adult. None present anthropogenic traces. A proximal ulna of a fox from here articulates with a distal humerus found in the northern zone (between complexes 4 and 5). A canine from a young brown bear was discovered in complex 1. Large canids are represented by nine individual specimens in the southern complexes. The remains relate to at least two adults. It is the only taxon in the southern zone for which a skeletal element is associated with ochre. This fragment, a left maxillary fragment, was found in complex 2. The ochre occurs mainly on the lateral side of the jaw; charcoal mixed with a loamy sediment adheres to the inside of the maxilla. The crown length of the P4 (22.2 mm) is smaller than the length of the carnassials from Palaeolithic dogs and Pleistocene and recent northern wolves and falls within the OR of the carnassial length in recent northern dogs (Table 7). This suggests that it could be from a “dog-like in size” canid. Another large canid specimen bears signs of human manipulations: a tibia from complex 2 displays a cut mark on the distal epiphysis, likely related to skinning. Its width can be described as “wolf-range in size” (Table 7). The width of the distal humerus from complex 1 is also “wolf-range in size” (Table 7). Horse remains derive from at least two adult individuals. The most abundant elements are jugal teeth, cannon bones and tibiae. Cut marks on a distal metatarsal and two cuboids are likely linked with skinning. The limb bones were broken for marrow extraction as attested by impact marks on the femur, tibiae and two metatarsal bones. Eight impacted fragments of a metatarsal bone refit with the two accessory metatarsals, all found in complex 1; the distal part of this metatarsus was discovered in complex 4 (as also noted by Ivanova et al. 1987; see section “Understanding the Differences Between the Southern and Northern Zones”, above). One tool was fabricated from a metacarpus. There are four bones of large bovid; a cannon bone displays impact traces and a second phalanx bears cut marks, probably related to skinning. The faunal assemblage from the northern complexes studied by us included a total of 1219 bone fragments, with a NISP of 655 (54%) (Table 4). The following taxa were identified: large canids, fox, bear, lynx, mammoth, horse, woolly rhino, reindeer, large bovids and saiga. Eighteen per cent of the remains showed traces of human modification. Two bones had been gnawed by a carnivore. Large canids are the best represented taxon by MNI in the northern assemblage, with the remains of at least five individuals present (Table 5). Two articulating cervical vertebrae derive from a subadult (complex 4). A first lower molar shows very little wear and is from a young animal (complex 4). Its large crown length (32.5 mm) falls outside the ORs of Palaeolithic and recent northern dogs and is larger than the means of the ORs of Pleistocene and recent northern wolves (Table 7); this suggests that it is from a “wolf-like in size” animal. The rest of the large canid assemblage consists of the remains of adult animals. Fragments from a left and right pelvis and a left and right femur from one individual (the right femur head articulates with the acetabulum) were found in adjacent squares in complex 3. Cut marks, probably related to dismembering, occur on the left pelvis near the acetabulum. A lower jaw found in complex 4 with worn teeth displays cut marks on its lingual side. There are marks on the diaphyses of a femur and tibia that are likely related to filleting. A large distal femur and a proximal tibia from complex 5 can be described as “wolf-like in size” (Table 7). Cut marks can be discerned on a distal metapodial fragment. Two femora show impact traces that may be related to marrow extraction. The mammoth is the most abundant species in the northern zone based on the NISP (Table 5). The remains consist of dental and postcranial material. The list of skeletal elements is much more varied than in the southern mammoth assemblage and includes fragments of tusks and ivory, vertebrae, ribs, scapulae, long bones, carpalia, tarsalia, metapodial bones and phalanges. A lower jaw with an m3 whose first plates are in wear is probably from a young mammoth, about 3 years of age (cf. Maschenko 2002). A subadult femur diaphysis corresponds in size to a femur of a mammoth from Sevsk of about 6–7 years of age (cf. Maschenko 2002). Several mammoth elements are coloured by ochre. Ivory tools and ornaments and an incised mammoth rib, coloured with pigments, also form part of the assemblage from the northern group (section “Overview of Previous Work on the Planigraphy and Assemblage of Layer III”, above). Some mammoth remains were excavated from the area between complex 3 and complex 4. A scapula of a mammoth calf is very comparable in size to the scapula from Lyuba (Fisher et al. 2014: Fig. 6); the individual could have been—like the Lyuba calf (Rountrey et al. 2012)—between 1 and 2 months old when it died. A fragment from a hyoid apparatus was found in this zone (Fig. 13). An astragalus has been gnawed by a carnivore. In the northern zone, reindeer is the second best represented species by NISP, with a frequency of 10.6% (Table 5). This cervid is mainly represented by long bone remains. Most are broken and show impact traces. Cut marks occur on a distal humerus. A bone tool was fabricated from a distal metacarpus. It is interesting to note that reindeer antler is lacking at the site. Horse is the third best represented species. The dental material includes two series of permanent molars and a series of remains including the germs of upper molars with a milk molar that fits onto one of these. This indicates that a foal was killed during its first year. The postcranial material includes several rib fragments, one with cut marks; limb bones, some with impact traces; and a calcaneum and cuboid with cut marks. A distal metatarsus fragment with an impact mark was recovered from complex 4; it refits with several other fragments discovered in the southern zone. Ten fragments of arctic fox were recovered from the northern zone; none show anthropogenic traces. A distal humerus of a fox found between complex 4 and complex 5 articulates with a proximal ulna from the southern zone (complex 2). The large bovid remains consist mostly of ribs. One vertebral spine bears cut marks. The only remain from a brown bear in the northern zone is a third phalanx found in complex 3 (Table 5). In strong contrast with the faunal assemblage from the southern complexes, we did not find any hare remains in the assemblage from the northern zone (although Ivanova et al. 1987 note the presence of hare remains in complex 3 and it is possible that this relates to material that was missing from the collection we studied in 2017). However, four species are present in the northern zone faunal assemblage that are absent from the southern zone: reindeer, saiga antelope, woolly rhinoceros and lynx. Four metapodial fragments of saiga antelope were recovered from the northern zone; two display impact marks consistent with marrow extraction. The assemblage from the northern zone yielded remains from at least two woolly rhino individuals: two milk tooth fragments and a capitate bone. The northern assemblage also contains the only felid remain of the site. This is a fragment of a lower jaw from a lynx, described in detail by Sablin (2001). The results of the lithic and faunal studies presented here confirm the strong differences between the northern and southern parts of Kostënki 21/III. This raises the question of whether all parts of the site represent a single phase of occupation, as favoured by previous researchers (Section Understanding the differences between the southern and northern zones), or whether two chronoculturally distinct phases of occupation might be represented within the layer. One approach to this question involves comparison of the lithic assemblages from this and other sites. The existence of other contemporary sites where both types of backed lithic points are found together would support the hypothesis that Kostënki 21/III relates to a single phase of activity. However, if only one or other type of point is found in other assemblages, then this would support the possibility that layer III in fact represents a palimpsest of two chronoculturally distinct phases of activity. 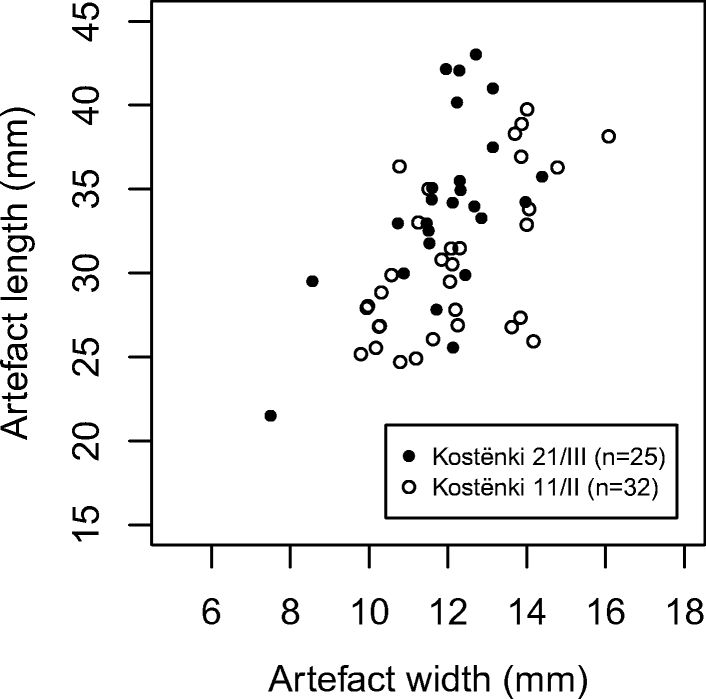 Shouldered points are widespread in Eastern and Central European late Gravettian assemblages but vary widely in their dimensions and the specifics of their morphology and technology. The majority of shouldered point collections (e.g. Kostënki 1/I, Avdeevo, Kraków-Spadzista) are very obviously different from the Kostënki 21/III assemblage in the range of dimensions and proportions of the artefacts (Otte 1981; Gvozdover 1995, 1998; Bulochnikova 1998; Bulochnikova and Grigor’ev 2005; Wilczyński 2007, 2015) and also appear to be somewhat older than the Kostënki 21/III assemblage (Reynolds 2014). However, the site of Gagarino is known for an assemblage of small shouldered points (Tarasov 1979) and may be approximately contemporary with Kostënki 21/III, so we studied collections from this site as a comparison for Kostënki 21/III. Anosovka points have been described at several sites apart from Kostënki 21/III: the nearby Kostënki 11/II, and Pushkari I and Klyusy (both in Ukraine) (Fig. 1) (Rogachёv and Popov 1982; Soffer 1985; Tkachenko 2002; Beliaeva 2008; Sinitsyn 2007, 2014; Stupak 2008; Gavrilov 2016). We directly studied the assemblage from Kostënki 11/II for comparative purposes and referred to the published literature on Pushkari I and Klyusy. The data recorded for Gagarino and Kostënki 11/II are available in SI 1–3 of this article. We also compared the results of our faunal analyses with published results for Kostënki 11/II and Pushkari I (Vereshchagin and Kuz’mina 1977; Soffer 1985; Demay et al. 2016). Gagarino is located on the Don River, c. 150 km north of Kostënki and c. 45 km north-west of the city of Lipetsk (Fig. 1). The site was found in a shallow ravine which opens onto the eastern (left) bank of the river, about 250 m from the mouth of the ravine (Zamiatnine 1934; Tarasov 1979). A single Palaeolithic cultural layer, with a late Gravettian lithic assemblage, was found at the site. A circular concentration of material has been interpreted as the remains of a dwelling structure—in fact, the first Palaeolithic dwelling identified in Russia (Zamiatnine 1934; Childe 1950; Tarasov 1973; Djindjian 2013). The site is perhaps best known for finds of sculpted female figures, including one “double” figure (Tarassov 1971; White 1997). The question of whether the site should be included in the Kostënki-Avdeevo Culture remains debated: the main problem is that the shouldered points from Gagarino are very small relative to those found at Kostënki 1/I, Avdeevo and Zaraisk (e.g. Tarasov 1979: 78; Bulochnikova 1998; Sinitsyn 2007). The radiocarbon dates for Gagarino (Table 8) are best treated as minimum ages, with the exception of the most ancient date, which likely relates to a fossil mammoth tooth used or found at the site. This suggests an age of >c. 21,500 14C BP for the site, or > c. 25,500 cal BP. Such an estimate is similar to the suggested age for Kostënki 21/III of 27,500–24,500 cal BP. An unpublished radiocarbon date for Gagarino also falls within the time bracket suggested for Kostënki 21/III (K. Douka, pers. comm.). The assemblages from both Gagarino and Kostënki 21/III include small shouldered points but no large shouldered points. This is in clear contrast with the principal sites of the Kostënki–Avdeevo Culture, where both large and small shouldered points are present (Gvozdover 1995, 1998; Bulochnikova 1998; Bulochnikova and Grigor’ev 2005). Given that Gagarino and Kostënki 21/III are also potentially penecontemporary, we undertook a techno-typological comparison of the shouldered points from the two sites, in order to test the degree of similarity in this artefact type (SI 1, 3). However, we found some clear differences. In the Gagarino collections held at the State Historical Museum, Moscow, and MAE RAS (Kunstkamera), Saint Petersburg, we identified a total of 15 shouldered points (the criteria for acceptance as a shouldered point were the same as those applied to the Kostënki 21/III assemblage). The artefacts included seven unbroken points, six distal fragments and two proximal fragments. As at Kostënki 21/III, the points are typically made on regular bladelets. The lateralisation of the shoulders in the Gagarino collections is very similar to that for the Kostënki 21/III material—10 of 15 (67%) of the Gagarino artefacts have their shoulders on the right edge of the artefacts (for Kostënki 21/III—30 of 47, 64%). 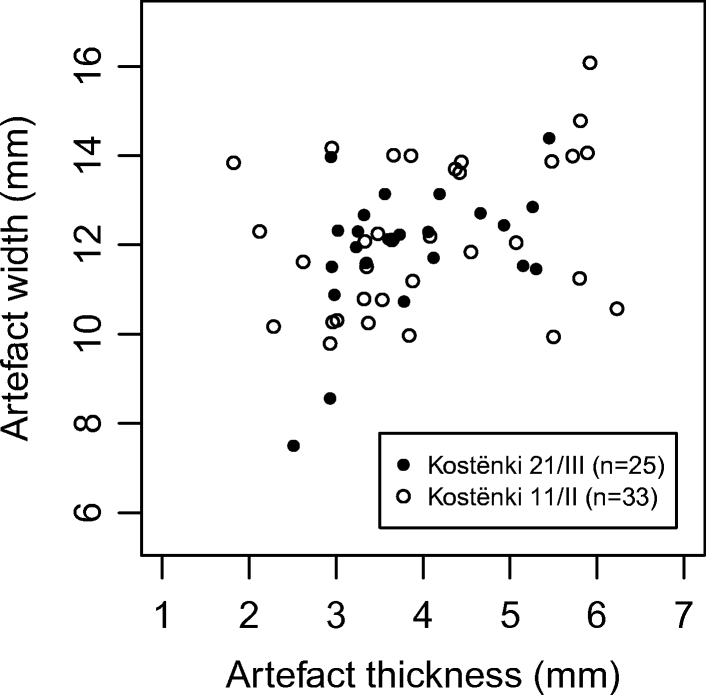 The ranges of widths and thicknesses of the groups of artefacts from both sites are also similar (Fig. 14). However, there are also definite differences. In some cases, it was difficult to distinguish between a “shouldered point” and a “backed point with gibbosity” in the Gagarino collections: there is essentially a morphological continuum between these two artefact types. This is not the case for Kostënki 21/III. The unbroken points from Gagarino are also generally shorter than those from Kostënki 21/III (Fig. 15). The results of a Wilcoxon rank-sum test suggest that the differences between the lengths of the artefacts in the two collections are statistically significant (Z = − 2.278, p < 0.02; see SI 4 for R code and full results). In contrast with the Kostënki 21/III shouldered points, the Gagarino points have almost always have had their striking platforms and bulbs of percussions removed. 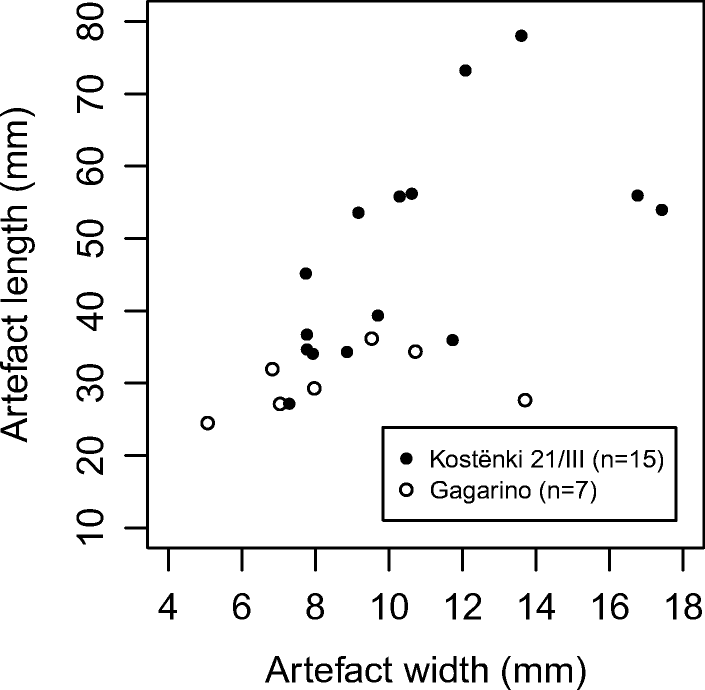 Furthermore, among the unbroken artefacts, there is much greater variation in limbe length as a proportion of the full length of the artefact in the Gagarino collections than in the Kostënki 21/III collection, despite the fact that there are fewer artefacts in the Gagarino collections (Fig. 16). 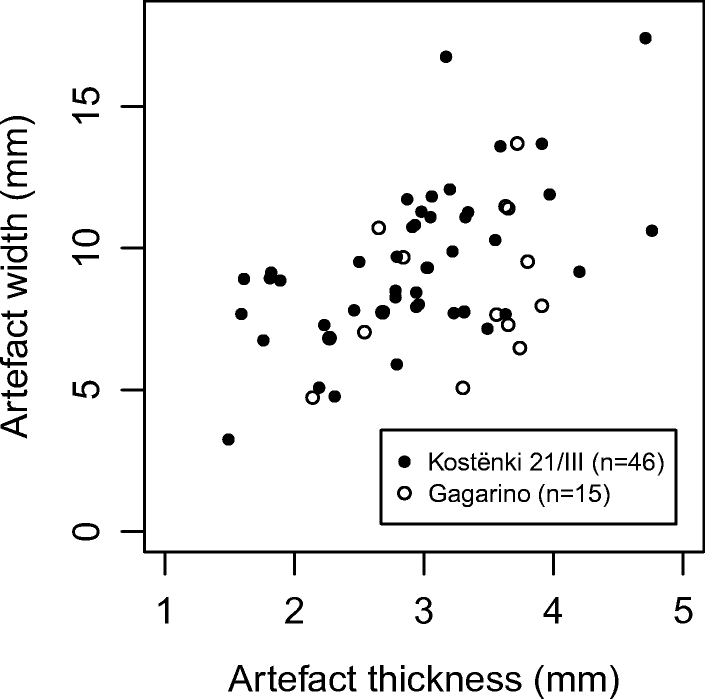 This suggests that any constraints on the proportions of the artefacts were even weaker for the Gagarino material than the Kostënki 21/III points. Finally, ventral/bifacial retouch of the distal ends of the points is far more prevalent among the Gagarino artefacts (8/13 observable distal ends, 62%) than the Kostënki 21/III artefacts (4/45 observable distal ends, 9%). These differences are comprehensive enough that we judge there is no strong reason to link the Gagarino and Kostënki 21/III shouldered point collections. They may both be connected in the context of a widespread tradition of manufacturing shouldered points as seen in late Gravettian assemblages in Eastern and Central Europe. However, the presence of small shouldered points and the absence of large shouldered points at Gagarino may be largely explained by raw material factors. Blank size appears to have been restricted by the use of small coloured flint cobbles as the predominant source of raw material (only 0.25% of the collection was made on imported chalk flint; Tarasov 1979, p. 62), unlike at Kostënki 1/I, Avdeevo and Zaraisk, where larger blade blanks were used (Giria and Bradley 1998; Es’kova 2015). 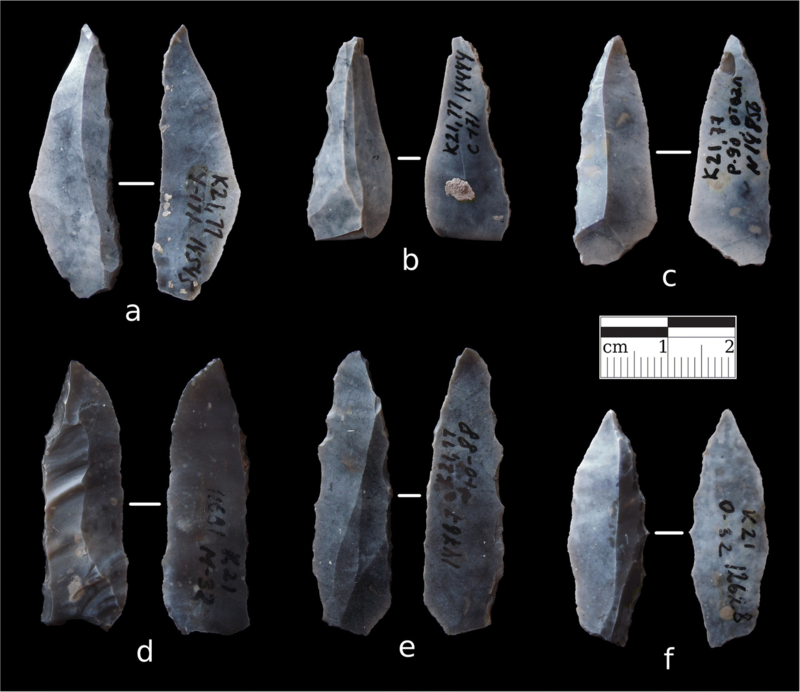 At Kostënki 21/III, the absence of large shouldered points is not a product of raw material factors: large blade blanks were used at the site and could have been used to manufacture large shouldered points. The “miniaturisation” of shouldered points at the two sites (when compared with the principal Kostënki–Avdeevo Culture and Kostënki-Willendorfian shouldered point assemblages) does not constitute a strong reason on its own for linking Gagarino with Kostënki 21/III. Kostënki 11 (Anosovka II), discovered in 1951, is located c. 2 km south of Kostënki 21 within the ravine of Anosovka Log (Fig. 2) (Rogachëv and Popov 1982). Up to eight archaeological layers have been identified at the site (see Dinnis et al. 2018 for a recent English-language summary). The principal excavations at the site took place from the 1950s to the 1970s, led by A. N. Rogachëv, although investigation of the site continues to the present day, now led by A. E. Dudin (Rogachёv and Popov 1982; Dudin 2016, 2017). During Rogachëv’s excavations of layer II, the remains of two concentrations of finds were recovered, which are often interpreted as being the remains of dwelling structures (the southern was oval, covering an area of c. 56 m2, and the northern was circular and c. 6 m in diameter). More than 13,500 flint artefacts were found in the former and c. 3000 in the latter. A large amount of ochre was found in the southern dwelling concentration, as well as numerous worked marl artefacts, including a series of small zoomorphic figures (Rogachёv and Popov 1982; Popov 1989; Abramova 1995; Popov and Pustovalov 2004). The published dates for layer II (Table 9) of 15,200 ± 300 (TA-34) and 21,800 ± 200 (GIN-2531) are likely problematic: the former date is best ignored given that it is much younger than dates for the overlying layer Ia, while the latter is probably best treated as a minimum age. On the other hand, recently obtained dates for layer III of the site can be used as a terminus post quem for layer II. The new layer III dates, when combined and calibrated, produce a result of c. 28,000–27,500 cal BP (Dinnis et al. 2018). Taken together with the assumption that GIN-2531 represents a minimum age for the layer, this suggests an age for layer II of c. 27,500–25,500 cal BP (using IntCal 13 and OxCal 4.3; Bronk Ramsey 2009; Reimer et al. 2013). This is broadly similar to the approximate age suggested above for Kostënki 21/III of 27,500–24,500 cal BP. The lithics found at Kostënki 11/II include a series of Anosovka points, which are in fact called after Kostënki 11’s alternative name of Anosovka II. The similarity between the Anosovka points found at Kostënki 21/III and Kostënki 11/II has been repeatedly noted (Ivanova 1985; Sinitsyn 2007, 2014, 2015; Anikovich et al. 2008). The presence of Anosovka points was confirmed during our recent re-study of the material. We identified a total of 33 Anosovka points in the collection held at the Kostënki State Archaeological Museum-Reserve, Voronezh Oblast. Similar to Kostënki 21/III, there are a significant number of backed bladelets in the Kostënki 11/II collection (Sinitsyn 2013; cf. Rogachёv and Popov 1982), including numerous truncated examples. During this study, the entire collection was checked for the presence of shouldered points: none were found. The results of the studies of the Anosovka points from Kostënki 21/III and Kostënki 11/II were compared (SI 2, 3). Overall, they indicate that the artefacts are extremely similar at the two sites. Figures 17 and 18 show plots of the width and length, and the thickness and width, of the Anosovka points from each site: these demonstrate the high degree of similarity in the dimensions of the two series of artefacts. The mean length of the points from Kostënki 21/III (34.1 mm; SD 5.2 mm; range 21.5–43.0 mm) is slightly greater than that for the points from Kostënki 11/II (30.8 mm; SD 4.6 mm; range 24.7–39.8 mm). The results of Wilcoxon rank-sum tests suggest that both the similarities in widths and thicknesses and the difference in lengths are substantive (results of tests on width measurements: Z = 1.233, p > 0.8; thickness: Z = 0.077, p > 0.5; length: Z = − 2.271, p < 0.02; see SI 4 for R code and full results). The technological characteristics of the two series of artefacts are extremely similar. The rate of “reversal” of the point orientation with respect to the blank orientation (i.e. the number of cases where the pointed part of the artefact is located towards the proximal end of the blank) is similar between both sets of artefacts: 20 of 26 artefacts from Kostënki 21/III (67%) and 22 of 33 from Kostënki 11/II (77%) have these reversed orientations. The ratios of backing lateralisation are also similar in both collections: 19 of 26 artefacts from Kostënki 21/III (70%) and 23 of 33 from Kostënki 11/II (73%) are backed on the left edge of the artefact (left and right defined in relation to the artefact, rather than blank, orientation: i.e. with the pointed end positioned distally). The identification of Anosovka points at both Kostënki 21/III and Kostënki 11/II and the strong similarities between the corpus of points found at each site appear secure. This artefact type has also been identified at the sites of Pushkari I and Klyusy (Ukraine) (Soffer 1985; Beliaeva 2008; Sinitsyn 2014; Gavrilov 2016). The published radiocarbon dates for Pushkari I suggest that it is of a similar age to the two Kostënki sites, if we again treat the most ancient dates as the most likely to be correct (Table 10). As at Kostënki 11/II, no shouldered points similar to those found at Kostënki 21/III have been found at Pushkari I or Klyusy (Beliaeva 2002; Tkachenko 2002; Bulochnikova and Grigor’ev 2005; Nuzhnyy 2008; Stupak 2008). Hence, it seems that Kostënki 11/II and probably Pushkari I and Klyusy do provide strong analogies for the assemblage from the northern complexes (but not the southern) of Kostënki 21/III. The published results of faunal analyses for Kostënki 11/II and Pushkari I show some interesting points of comparison for Kostënki 21/III. A recent study of the faunal assemblage from excavation area VII of Pushkari I (Demay et al. 2016) found that mammoth, fox (both Alopex lagopus and Vulpes vulpes), wolf, horse and reindeer were present (Table 11). All these taxa (except Vulpes vulpes) were also identified at the northern complexes of Kostënki 21/III: the difference between the assemblages lies in the fact that a broader range of mammals is represented in the latter collection. The data for the mammoth from Pushkari I (VII) are also similar to those for the northern complexes of Kostënki 21/III: adult mammoths dominate the assemblage (to a greater extent than seen at many other MUP sites), and there is good overall representation of skeletal elements, including ribs and upper limbs (Demay et al. 2016). The mammoth remains in the faunal assemblage from excavation area V of the site, studied by Sablin (1997), represented adult individuals only, and no hares were present. The collection from the earlier excavations of areas I–IV of Pushkari I also did not yield any hare remains, but mammoth, woolly rhino, horse, reindeer, bear, wolf and arctic fox remains were all found (Rudinskii 1947; Boriskovskii 1950; Soffer 1985). The species profile for Kostënki 11/II is somewhat broader than for Pushkari I (VII), with lion, wolverine, woolly rhino and beaver represented (Table 11). Most interestingly, hare is also well-represented in the Kostënki 11/II assemblage. As outlined above, this is absent or near-absent from the assemblage from the northern complexes of Kostënki 21/III but is well-represented in the southern complexes. This observation may be used as evidence against some functional explanations for the separation between particular types of lithic and faunal material in the complexes of Kostënki 21/III. If the separation between Anosovka-type points and hare remains at Kostënki 21/III is attributable to a functional explanation, then why are they found in apparent association at Kostënki 11/II? To date, Kostënki 21/III has been an extremely problematic site for the chronocultural framework for late MUP Eastern Europe, with no convincing analogies known within the archaeological record of the region. It represents a unique example of a late Gravettian open-air site with extraordinarily marked spatial patterning. The fact that the cultural layer can be divided into two areas based on grounds of planigraphic, lithic techno-typological and faunal evidence is well-established. The most obvious differences seen in the lithic techno-typology of the two groups of complexes concern the representation of backed point types. The presence of shouldered points in the southern complexes only, and Anosovka points in the northern complexes only, is extremely striking. All of these observations give good grounds for suspecting that two distinct phases of activity may be represented within the layer. Here, it is worth considering our observations concerning flint patination at the site. In previous studies, subtle differences in the overall profiles of lithic raw materials used at the two groups of complexes have been noted, but the significance of the flint patination has not received attention. According to these earlier studies, in the complexes of the southern group, fine-grained “black” (very dark brown translucent) or, less often, translucent light brown/grey flint was used, alongside very rare usage of quartzite and other flint (c. 0.2% of artefacts). In the northern group, the lithic raw material profile was found to be even more homogeneous, with “black” fine-grained flint used for the overwhelming majority of artefacts (Praslov and Ivanova 1982; Ivanova 1985). There are no known primary flint sources in the immediate vicinity of Kostënki, and high-quality material at all sites may have been imported over at least several tens of kilometres (Boriskovskii 1961; Yurgenson et al. 2012). Relative age of the artefacts: the artefacts from one group of complexes could be older than those from the other. Depositional context of the artefacts: there could have been unrecognised, subtle stratigraphic variations in the sediment found within the layer—e.g. more alluvial or more loessic. In this case, one group of complexes could have been deposited within one type of sediment, with the second group deposited within a different type of sediment stratigraphically above or below the first type (but with minimal depth difference). The differences in burial conditions could then have caused the differences we see in the patination of flint. This explanation implies an age difference between the two groups of complexes, although the difference may be very small. Raw material: the flint used for the two groups of artefacts could have been from different sources with different chemical properties. This is most easily explained by a cultural separation between the two groups of complexes, i.e. different usage of flint sources by people employing different lithic traditions, and separate stages of occupation of the two groups of complexes. All three possibilities, however, suggest that there was a real separation between the creation of the two groups of complexes. Any suggestion that the differences in patination are in fact a coincidence is difficult to sustain given the particular spatial patterning of the complexes: why should natural variation in, e.g. sediment humidity within a synchronous layer, match the patterns of deposition of lithic artefact types so closely, especially when complexes 2 (southern group) and 3 (northern group) are so near to each other? There are other sites where differences in patination have been used to argument for a palimpsest situation within an archaeological layer originally considered as synchronous. These include the Mesolithic site of Thatcham III, UK (Reynier 2000), and the Final Upper Palaeolithic and Mesolithic site of Picamoixons, Spain (García Catalán et al. 2009). The consensus view on Kostënki 21/III for several decades has been that the layer is the result of a synchronous or quasi-synchronous settlement of the area. However, if two separable stages of occupation are represented in the layer, and the northern and southern groups of complexes relate to distinct phases of activity, rather than functional differentiation, then this would explain the differences in lithic techno-typology, faunal assemblages, planigraphy of structures, lithic raw material and patination seen at the site. It would also greatly simplify our efforts to compare the site with other sites in Eastern Europe. If we separate the layer into layer III (North) and layer III (South), we can see links between layer III (North) and Kostënki 11/II, Pushkari I and Klyusy (Table 12). Kostënki 21/III (South) would remain without obvious close analogies at present, although it fits well within the overall corpus of Gravettian sites. The potential age difference between the two parts of the site cannot currently be estimated due to the inadequacy of the available radiocarbon dates (section “Chronology and Palaeoclimate”, above). Our formal study of the Kostënki 21/III shouldered points shows, as implicitly or explicitly argued by previous researchers (e.g. Praslov and Ivanova 1982; Ivanova 1985; Sinitsyn 2007, 2015), that there is no reason to link this assemblage with the Kostënki–Avdeevo Culture. Further work is necessary to understand the significance of the presence of morphologically diverse shouldered points at numerous late MUP sites in Eastern and Central Europe, including Kostënki 21/III, the Kostënki–Avdeevo Culture sites, the “shouldered-point horizon” sites further west, and sites such as Dorochivtsy III in Ukraine (Otte 1981; Grigor’ev 1993; Gvozdover 1995; Kozlowski 1998; Kulakovska et al. 2012, 2015; Sinitsyn 2007, 2015). Other approaches could be applied to the Kostënki 21/III collection in order to further test the contemporaneity of the complexes. The collection is a prime candidate for a lithic refitting study: if refits could be found between different concentrations, this would of course strengthen the case for their contemporaneity, especially if refits were found between lithic artefacts with different levels of patination. Geochemical analyses of flint samples could also be used to explore differences in raw material sourcing and any correlation with the degree of patination. Further examination of other aspects of the lithic assemblage, and new formal comparisons with other assemblages, would also be of great help in clarifying the issues discussed here. Finally, further radiocarbon dating work, perhaps using single amino acid techniques for greater reliability (Devièse et al. 2018), could also help to test the hypothesis presented in this paper. Although the absence of a clear age difference between the two parts of the site would not disprove the possibility that two separate stages of occupation are represented in the layer (because the age difference may be too small to be discernible using radiocarbon dates), any significant difference between the radiocarbon dates for the northern and southern complexes would support the ideas put forward in this paper. Apart from the differences in lithic typology, the differences in faunal assemblages between the two groups are also strongly marked. Hare remains were well-represented in the southern complexes, but absent (in our study) or rare (in the study of Ivanova et al. 1987) in the assemblage from the northern complexes. Conversely, there is evidence for reindeer, saiga antelope, lynx and woolly rhinoceros at the northern complexes, which are absent from the southern complexes. Further differences between the southern and northern zones can be seen when we consider the particular human activities attested by the faunal evidence (Table 13). The faunal assemblage from the southern zone includes seven taxa, typical of a cold, steppic environment: hare, arctic fox, large canids, brown bear, woolly mammoth, horse and large bovids. Elements of all these species, except arctic fox and bear, show traces of human manipulation. Mammoth and horse remains were used as raw material for tools and/or ornaments, and the presence of a large number of ivory fragments, some with anthropogenic traces, as well as 16 ivory ornaments and two ivory tools, suggests that ivory working took place here, as was also attested by Ivanova et al. (1987). Cut marks and/or impact traces on skeletal elements from hare, horse and large bovids suggest that their skin, meat and/or marrow were sought after: in particular, there were many cut marks and impact traces on the horse bones. A tibia of a large canid bears a cut mark related to skinning. It is possible that the large canids were not consumed and that only their pelts were used. The only specimen from the southern assemblage associated with ochre is a jaw of a large canid that can be described as “dog-like in size”. In the slightly earlier (non-Gravettian) assemblage of Kostënki 8/I, dated to c. 27,500–26,000 cal BP (Dinnis et al. 2018), large canids are the most common group in the mammal assemblage and are mainly represented by paw elements, often in anatomical connection, suggesting the working of skins (Vereshchagin and Kuz’mina 1977). A canid femur from the same assemblage is “dog-like in size” (Germonpré and Sablin 2017). Hare is the predominant species in the southern complexes of Kostënki 21/III based on the MNI (Table 4). The fact that almost all skeletal elements of this species are represented suggests that complete animals were brought to complex 2 for processing and consumption (Ivanova et al. 1987). The pattern of all remains being from adult animals is typical for human exploitation of leporids (Lloveras et al. 2016). The hares were probably caught by setting snares in their trails (cf. Nelson 1983; Lupo and Schmitt 2002), and their skins could have been used to make baby hats and clothing (cf. Kurtness 2014). The other species in the southern assemblage are represented with a more limited diversity of skeletal elements, which suggests that initial butchering took place elsewhere, most likely in the vicinity of the kill sites (Ivanova et al. 1987). There is, however, one exception: practically all skeletal elements of mammoth calves are present. A cut-marked humerus from a mammoth foetus was found in complex 2; its meat was likely consumed. The presence of diverse skeletal elements from mammoth calves indicates the transportation of complete bodies of calves to the southern zone (cf. Ivanova et al. 1987). The adult assemblage is more restricted, and it seems that mainly head and foot portions from an adult mammoth were carried to complex 2, suggesting that mammoth head and foot pads were eaten. Elephant heads and foot pads have a large nutritional potential (Germonpré et al. 2008, 2014; Agam and Barkai 2016; Reshef and Barkai 2015). The difficult extraction of the edible shares from these elements must have required much time and energy, hence their presence at the living site where they were probably appropriately processed (cf. Agam and Barkai 2018). It is possible that the mammoth brain was accessed through the nasal aperture by removal of the trunk (cf. Goren-Inbar et al. 1994) or by removing the occipital bones, a method likely practiced at the Epigravettian Yudinovo site (Russian Plain), where several mammoth skulls lack the occipital bone and present an open braincase, facilitating access to the brain (Germonpré et al. 2008). Three cut-marked mammoth phalanges found at the French cave site of Grotte du Renne (Arcy-sur-Cure) indicate the willingness of Gravettian people to skin and/or disarticulate mammoth feet (Goutas and Lacarrière 2018). The mammoth calves found in the southern assemblage of Kostënki 21/III died at a range of ages of less than or about a year (Table 6; Maschenko 2002). Given that mammoth calves were likely born in early spring (Rountrey et al. 2012; Grigoriev et al. 2017), the calves at the southern complexes probably died during two different time periods: spring/early summer and autumn/early winter. Conception probably took place in late spring (Rountrey et al. 2012; Grigoriev et al. 2017), so the mammoth cow carrying a 14–16-month-old foetus likely died during spring/early summer. This suggests that mammoth hunting took place during the warm part of the year and at the beginning of winter. It is possible that the high-bulk harvest of mammoth meat was stored near the kill sites, where the carcasses were probably processed, and long bones left behind (cf. Binford 1993). It is not clear how the mammoth body parts were transported to the site. Body parts of mammoth calves would have been relatively easier to transport than body parts from adult mammoths (Agam and Barkai 2018). Mammoth hunting has been directly attested at the slightly earlier site of Kostënki 1/I by the find of a flint point fragment embedded in a mammoth rib (Praslov 2000; Nuzhnyi et al. 2014) and at an Early Upper Palaeolithic layer in Kostënki 14 by the find of an ivory point embedded in a mammoth rib (Sinitsyn et al. 2019). At the site of Kostënki 4, several thousand years older than Kostënki 21/III, where the main, lower layer at least can be described as Gravettian, mammoth material also pertains mostly to head and foot elements (Zheltova and Burova 2014). A higher degree of biodiversity is noted in the mammal assemblage from the northern zone than in the southern assemblage. Although hare is absent or near-absent here, one carnivore, the lynx, and three ungulates, the woolly rhinoceros, the reindeer and the saiga, enrich this assemblage (Table 5). Just as in the southern assemblage, the species present indicate an arid and cold open environment. However, the presence of lynx in this assemblage suggests that forested zones occurred locally. The arctic fox, lynx and brown bear remains do not show traces of human manipulation. Anthropogenic traces can be seen on the bones from large canids, mammoth, horse, reindeer, large bovids and saiga. These marks are related to filleting, marrow extraction and/or tool fabrication. Just as at several Gravettian sites from Central Europe (Fladerer 2001; Wojtal et al. 2012, 2018; Germonpré et al. 2017b), it is likely that large canids were consumed in the northern complexes of Kostënki 21/III: the specimens found at the northern complexes of the site can be described as “wolf-like in size” or “wolf-range in size”. No reindeer antler has been discovered from this zone although cranial and postcranial reindeer fragments are well-represented. 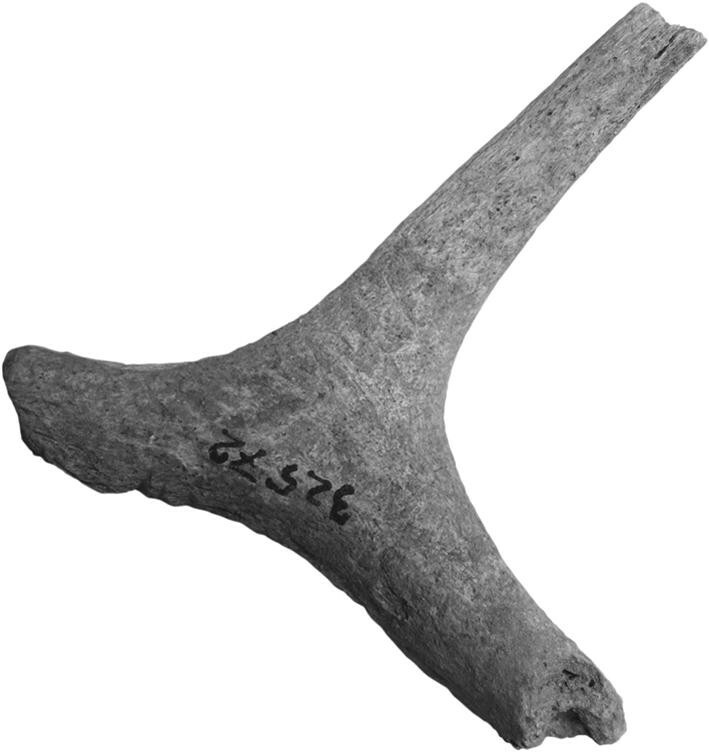 Reindeer antler has been found at other late Gravettian sites in Russia but is rare within individual assemblages, especially in comparison with sites in Central and Western Europe (Hromadova 2012; Goutas 2013, 2015). A more varied range of skeletal elements from adult mammoths was found in the northern assemblage than in the southern one. Interestingly, a fragment of a mammoth hyoid apparatus was found between complexes 3 and 4. The presence of mammoth hyoid bones at the Yana site (northern Siberia) has been postulated to be indicative of the transportation of the mammoth tongue from the kill site to the living site for consumption (Nikolskiy and Pitulko 2013). The frequency of mammoth foot bone elements is even higher in the northern assemblage than in the southern assemblage and the fat of the foot cushions was also probably utilised here. Remains of mammoth calves occur far less frequently than in the southern zone. Only one bone of a calf of about 1–2 months old at death was excavated here, from the area between complexes 3 and 4. Based on the birth season of the mammoth (Rountrey et al. 2012; Grigoriev et al. 2017), it died in spring. Bone tools were fabricated from mammoth ribs and ivory. Although a large number of ivory fragments were recovered from the northern zone, ivory artefacts were restricted to two pendant fragments. All these observations concerning the faunal assemblage illustrate differences between the southern and northern zones of the sites in terms of human activity, potentially reflecting cultural differences. One point must be noted, because it presents a possible argument to contradict our interpretation, and has in fact been previously cited in support of the synchronicity of the entirety of layer III (Ivanova et al. 1987; section “Understanding the Differences Between the Southern and Northern Zones”, above). Our new study confirms that there are two examples of refits of fragments of bones between the areas of the northern and southern complexes. As described above (sections “Understanding the Differences Between the Southern and Northern Zones” and “Southern Group (Complexes 1 and 2)”), a distal fragment of a horse cannon bone from the northern group (complex 4) could be refitted with a series of fragments discovered in the southern group (complex 1). A distal humerus of an arctic fox found between complexes 3 and 4 in the northern zone (1990/Б'-99) articulates with a proximal ulna from complex 2 in the southern zone (1971/Н-21). Processes such as carnivore activity have the potential to move individual bones by significant distances in open-air contexts (e.g. Yellen 1991; Camarós et al. 2013), but none of the horse cannon bone fragments bear traces of carnivore actions. The pale colour, the slight degree of weathering and the moderate amount of rootlet traces are very similar on all fragments. The comparable general aspect of the fragments suggests that the taphonomic history of the remains found in the northern and southern zones could be rather similar. Given these observations, we would suggest that some very limited deposition of material beyond the principal zone of activity could have taken place during each occupation of the site (which could be due to occasional kicking, movement by playing children, etc.). The fact that one of the refitting bones was found between two complexes supports this possibility. This, however, does not affect our main conclusion that two chronocultural phases of activity are represented at the site and that the vast majority of material from the southern zone relates to one such phase, while the vast majority of material from the northern zone relates to another. The six identified complexes at Kostënki 21/III can be divided into two groups according to several criteria: lithic techno-typology, the dimensions and planigraphy of the complexes, faunal remains and flint patination. There is a clear mutual exclusion between the types of backed points found in the northern and southern groups (Anosovka points only in the former, small shouldered points only in the latter) which has been previously noted and is confirmed by our work. The faunal assemblage from Kostënki 21/III provides some surprising insights into the behaviour of late MUP hunter–gatherer groups in Eastern Europe. The remains from the southern complexes provide evidence for the systematic exploitation of hares and for hunting of mammoth, with a particular focus on juvenile mammoth. Canids were likely used for their skins. In the northern complexes, there seems to have been more emphasis on the hunting of adult mammoths, while the canid remains provide evidence for both skinning and consumption. Hare was absent or near-absent in the assemblage from the northern complexes. Overall, however, a wider range of species is represented in the northern complexes than the southern. At both the northern and southern complexes, there is evidence for preferential transport of mammoth head and foot parts to the site. The canid remains at the site vary in size: one of those found in the southern complexes is “dog-like in size”. The range of ages of juvenile mammoths represented at the southern complexes suggests that activity took place at this part of the site during both spring/early summer and autumn/early winter. In the northern complexes, a more restricted period of human presence is attested: spring/early summer only. Previous researchers have explained the spatial patterning seen at Kostënki 21/III as a result of activity differences in various areas of the site. However, this patterning can alternatively be explained by the presence of a palimpsest of two chronoculturally separable phases of activity within the layer. This interpretation explains the strong spatial patterning seen at the site and, in particular, explains the differences in flint patination between the two parts of the site, which cannot be explained by an interpretation based on activity differences within a synchronously occupied area. If accepted, this interpretation largely solves the problem of the position of Kostënki 21/III within the chronocultural framework of MUP Eastern Europe. In this case, the northern group of complexes should be treated as representing one phase of activity, displaying lithic techno-typological affinities with material found at Kostënki 11/II, and probably Pushkari I and Klyusy. The southern group of complexes should be treated as representing a separate phase of occupation, although in common with previous researchers we were not able to identify any contemporary sites with convincing techno-typological analogies for the Kostënki 21/III shouldered points. If the interpretation suggested here is accepted, then the two parts of the layer should be treated separately for the purposes of inter-site comparison and cultural taxonomy: we suggest denoting them as “Kostënki 21/III (North)” and “Kostënki 21/III (South)”. The length of the suggested chronological difference between these two phases is not possible to discern given present evidence and may well be minimal (less than a century) although a somewhat longer gap in time cannot be ruled out (however, it seems very unlikely that it could be more than two to three millennia). With respect to wider work on spatial analyses of prehistoric hunter–gatherer sites, then if the arguments put forward above are accepted, Kostënki 21/III cannot be used as an example of a site with very strong techno-typological and activity patterning within a single simultaneously occupied area. The research presented here demonstrates the continuing potential of re-study of lithic and faunal collections for clarifying questions of chronocultural taxonomy and for new, detailed insights into the behaviour of Upper Palaeolithic hunter–gatherers. We would like to thank Alexander Dudin (Kostënki State Archaeological Museum-Reserve, Voronezh Oblast), Nina Khaikunova (State Historical Museum, Moscow) and Gennady Khlopachëv (Peter the Great Museum of Archaeology and Ethnography (Kunstkamera), Saint Petersburg) for kindly facilitating access to lithic collections. NR would like to thank Sonja Grimm for generous help with Federmesser points and Rick Schulting for discussions on flint patination and for drawing her attention to the work on Thatcham III. Particular thanks are due to Andrei Sinitsyn for highly productive and stimulating discussions and for his comments on a draft of this manuscript. We are very grateful to Katerina Douka for permitting us to refer to unpublished radiocarbon dates. We would like to thank Bertrand Panier for his help with Fig. 13. Finally, we thank the reviewers and editor for their comments, which helped to improve the manuscript. Any mistakes or shortcomings in the work naturally remain our responsibility. This work was supported by a Postdoctoral Study Grant from the Fondation Fyssen (NR) and the European Union’s Horizon 2020 research and innovation programme under the Marie Skłodowska-Curie grant agreement No 747400 (NR). AB’s work was supported by the RFBR grants 17-06-00319a, 18-39-20009-mol-a-ved and by state assignment № 0184-2018-0012. The participation of the Zoological Institute RAS (state assignment № АААА-А17-117022810195-3) in this research is acknowledged.